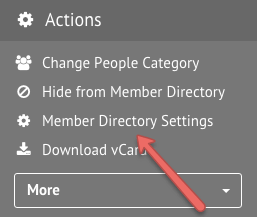 Once the Member Directory has been set up and made accessible in your account, both members and administrators have the ability to hide fields in individual profiles. This can be done by the individual themselves from within their ‘My Account’ window, or by an administrator within an individual’s profile. 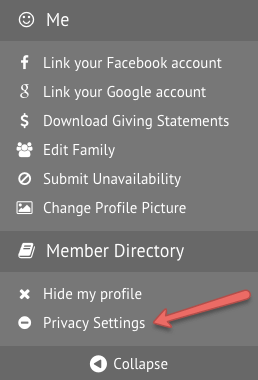 For a member, this can be done within the ‘My Profile’ page by selecting ‘Privacy Settings’ in the Actions pane. To change what is displayed in the Member Directory entry, simply select or unselect different fields to show. For example, if a person were to hide their Age and to show their Email Address, select to make Age show a grey box and to make Email Address box green. Like members, administrators can also select to manage an individual’s privacy settings within the Admin Area. Simply click ‘Member Directory Settings’ to bring up the window. Similar to the Privacy Settings window, simply change what is displayed in the Member Directory entry by selecting or unselecting different fields to show. Note that showing or hiding Privacy Fields would show the same information as a Member would see by hiding their own Member Directory fields.